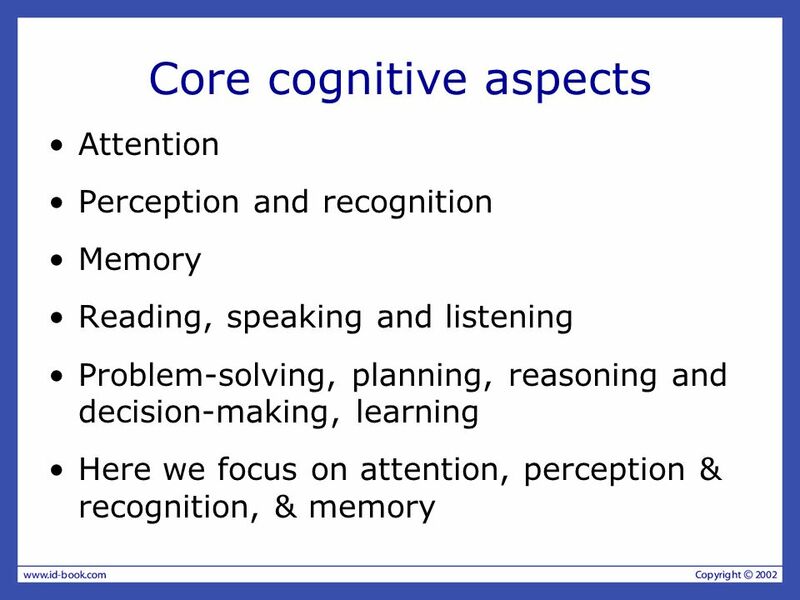 2 Overview What is cognition? 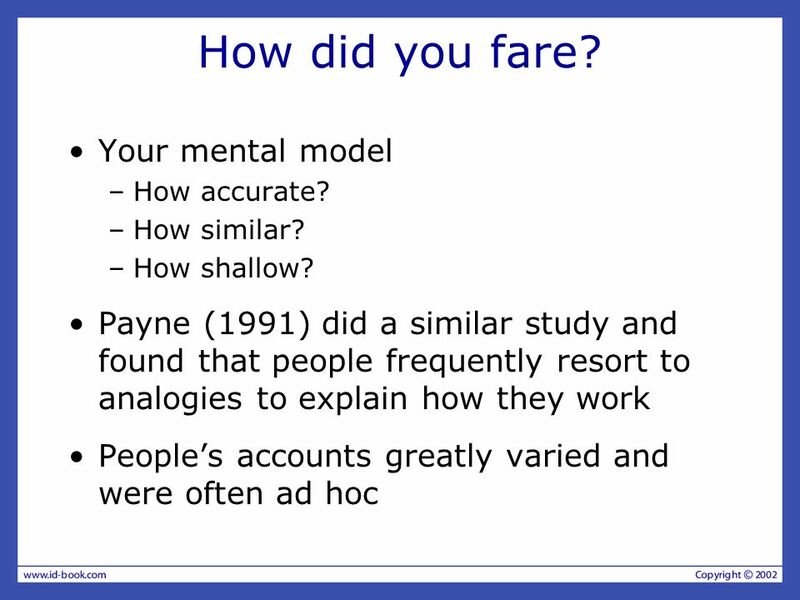 What are users good and bad at? 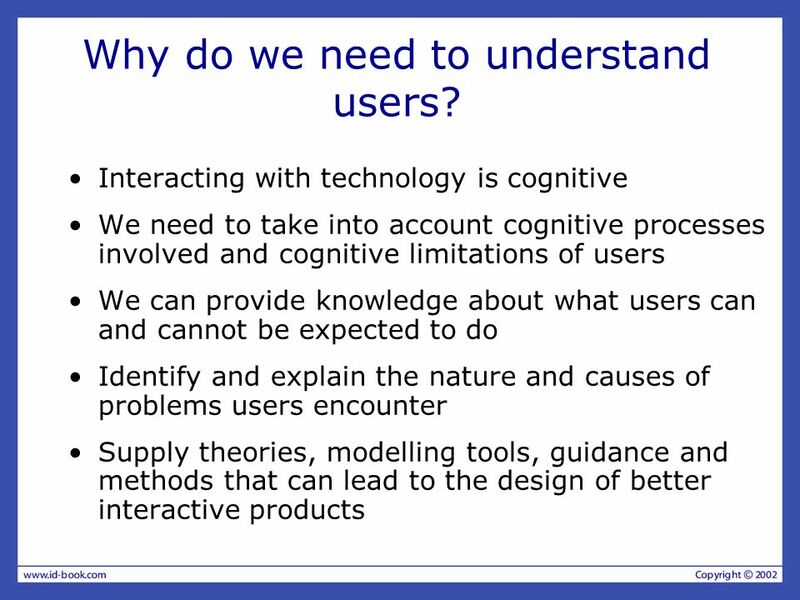 3 Why do we need to understand users? 10 Which is easiest to read and why? What is the time? What is the time? What is the time? 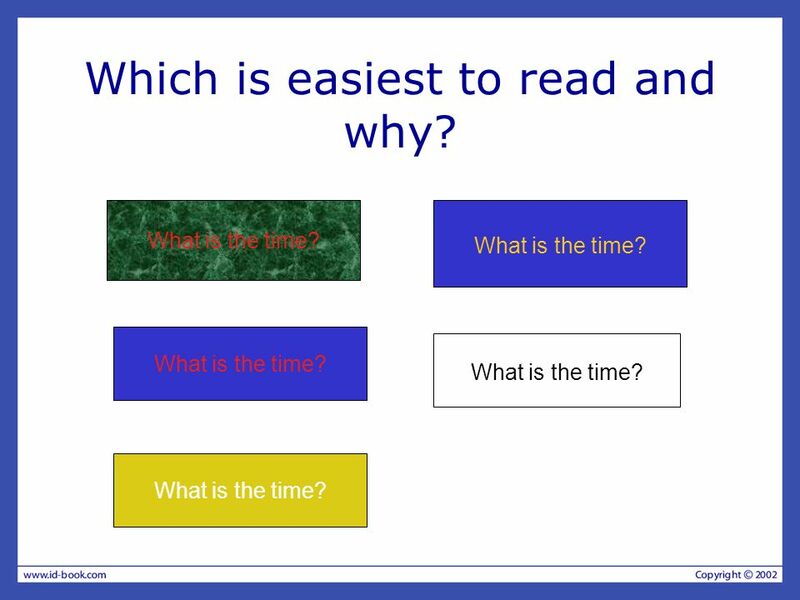 What is the time? What is the time? 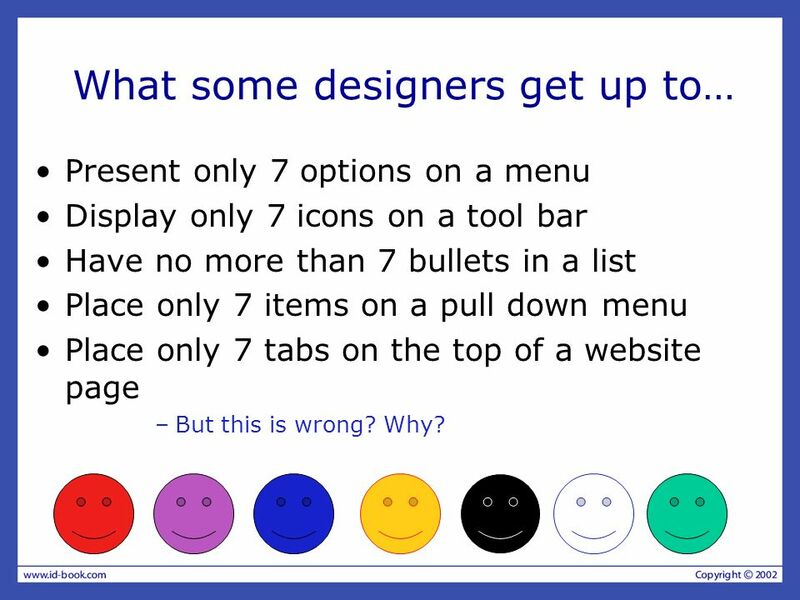 Present only 7 options on a menu Display only 7 icons on a tool bar Have no more than 7 bullets in a list Place only 7 items on a pull down menu Place only 7 tabs on the top of a website page But this is wrong? Why? You arrive home on a cold winter’s night to a cold house. 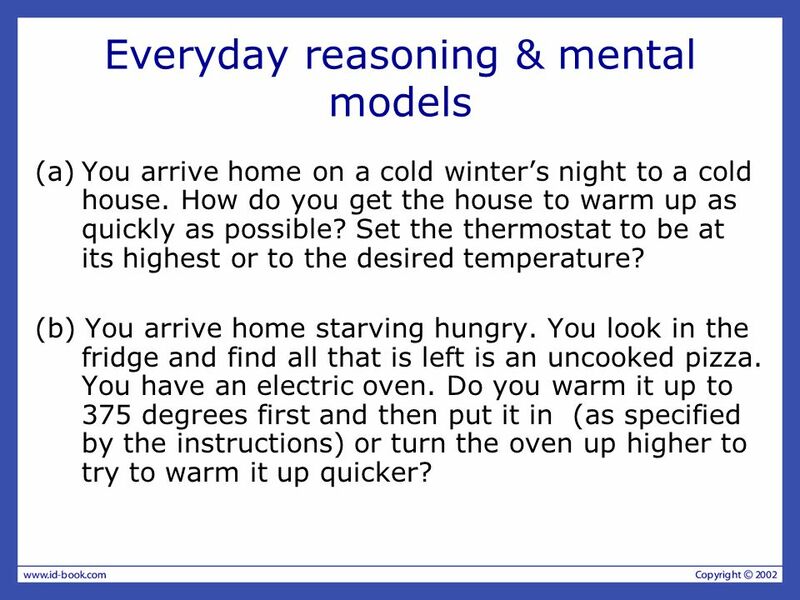 How do you get the house to warm up as quickly as possible? 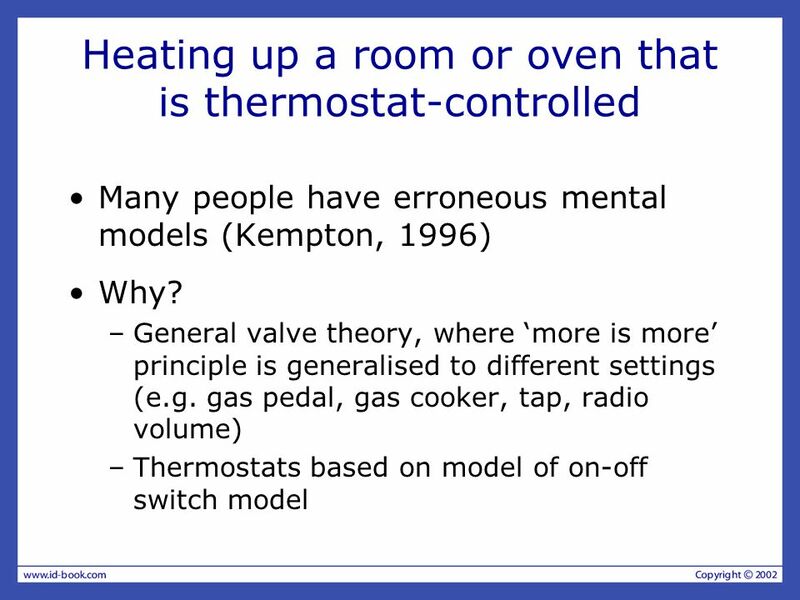 Set the thermostat to be at its highest or to the desired temperature? (b) You arrive home starving hungry. You look in the fridge and find all that is left is an uncooked pizza. You have an electric oven. Do you warm it up to 375 degrees first and then put it in (as specified by the instructions) or turn the oven up higher to try to warm it up quicker? How much money are you allowed to take out? What denominations? If you went to another machine and tried the same what would happen? What information is on the strip on your card? How is this used? What happens if you enter the wrong number? 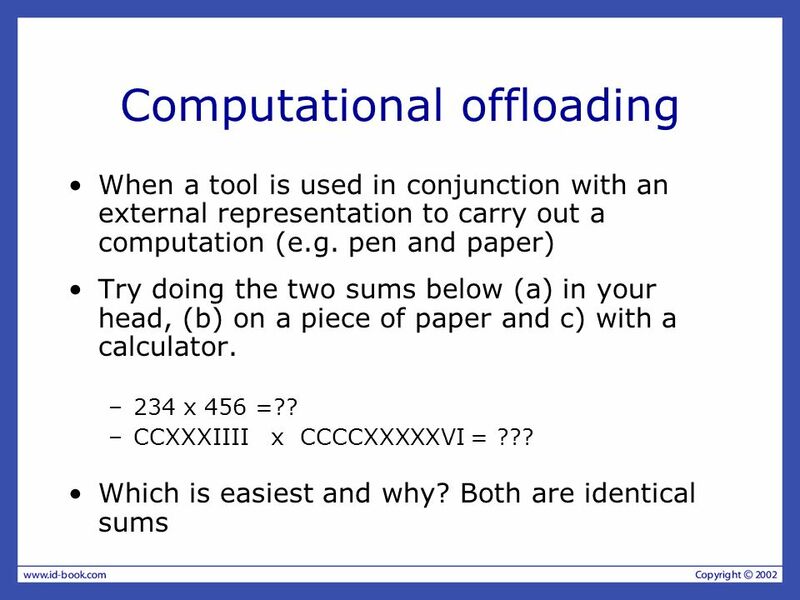 Why are there pauses between the steps of a transaction? What happens if you try to type during them? 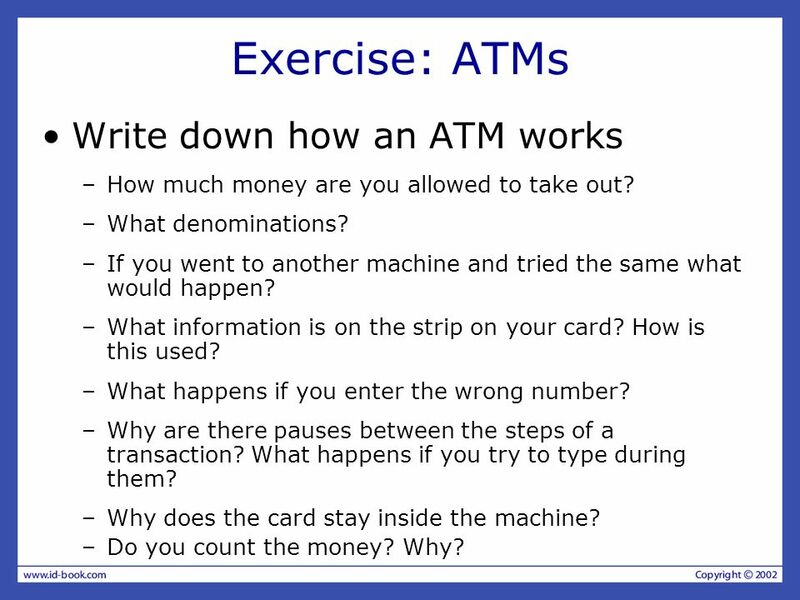 Why does the card stay inside the machine? Do you count the money? Why? 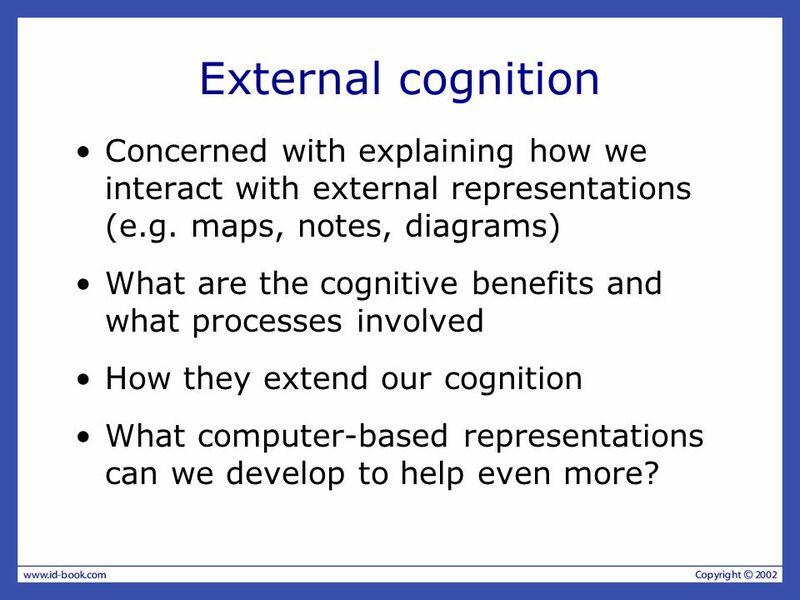 24 External cognition Concerned with explaining how we interact with external representations (e.g. 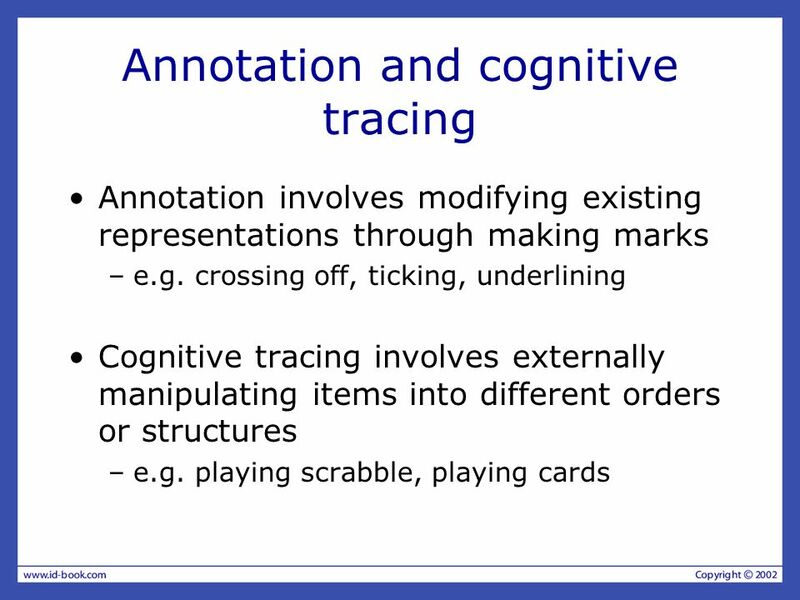 maps, notes, diagrams) What are the cognitive benefits and what processes involved How they extend our cognition What computer-based representations can we develop to help even more? 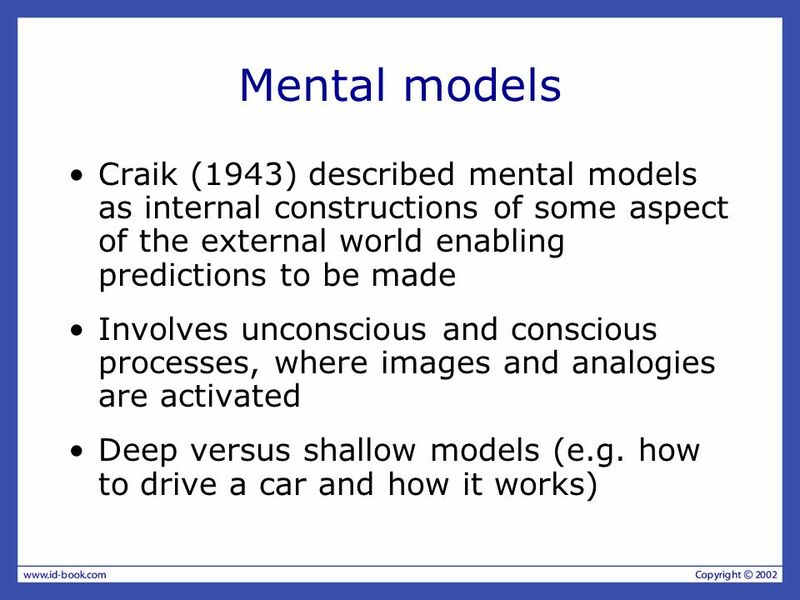 Communication Theory Lecture 1: Introduction to Communication Theory and Novel Technology Dr. Danaë Stanton Fraser. 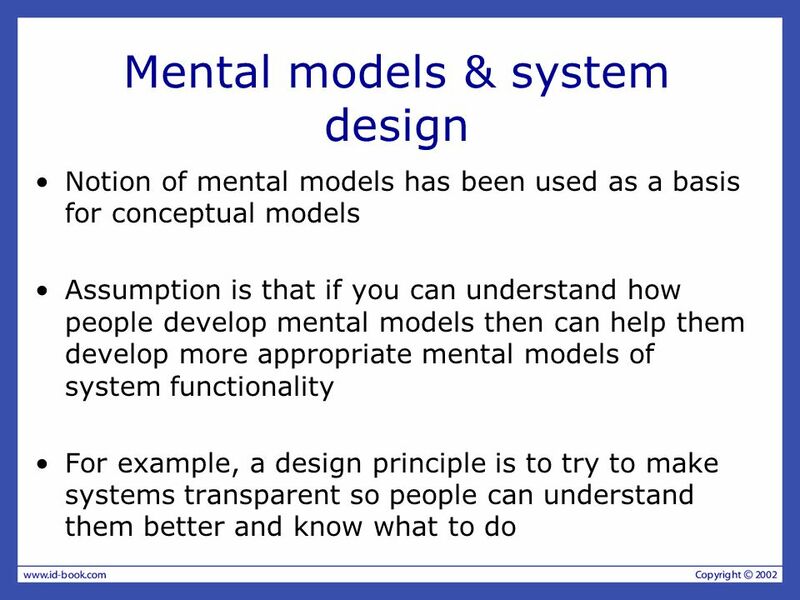 Last time… Conceptual models –To what is it similar? What metaphors do they bring to bear? 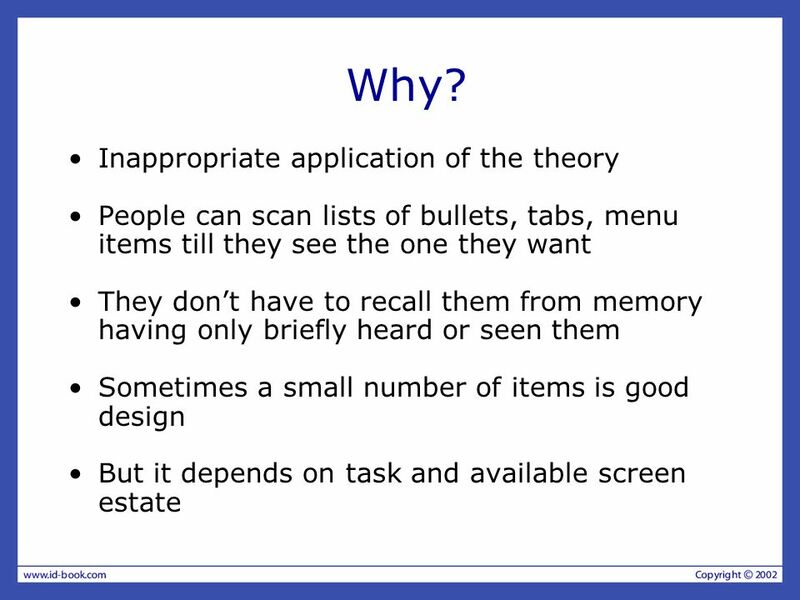 –What actions can one perform on or with a web page? 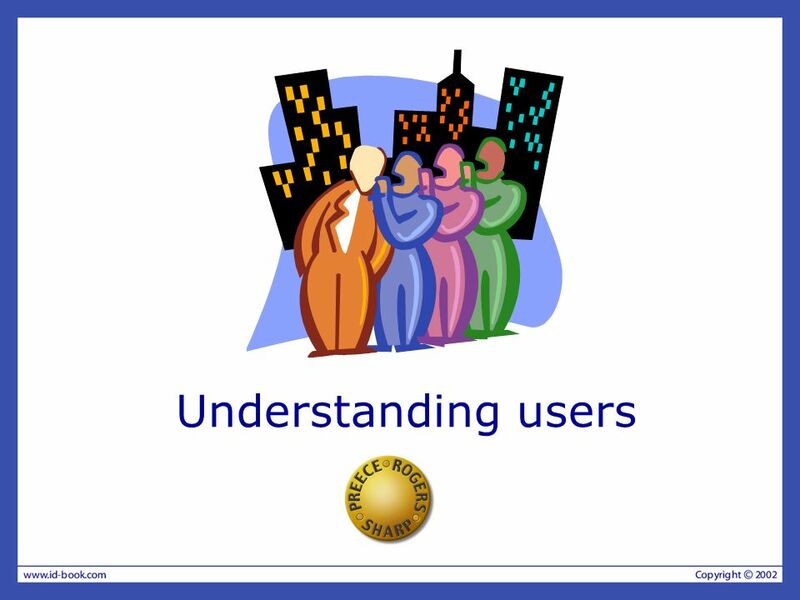 Chapter 3: Understanding users. 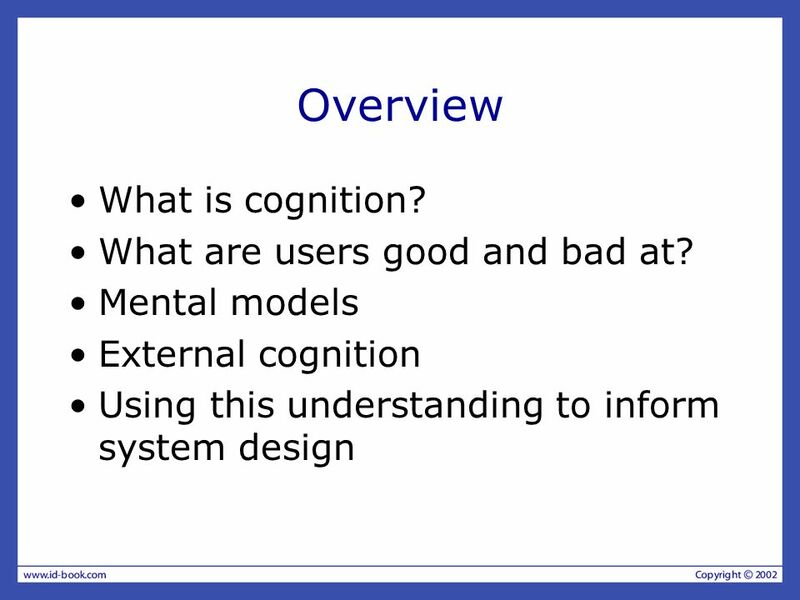 Overview What is cognition? 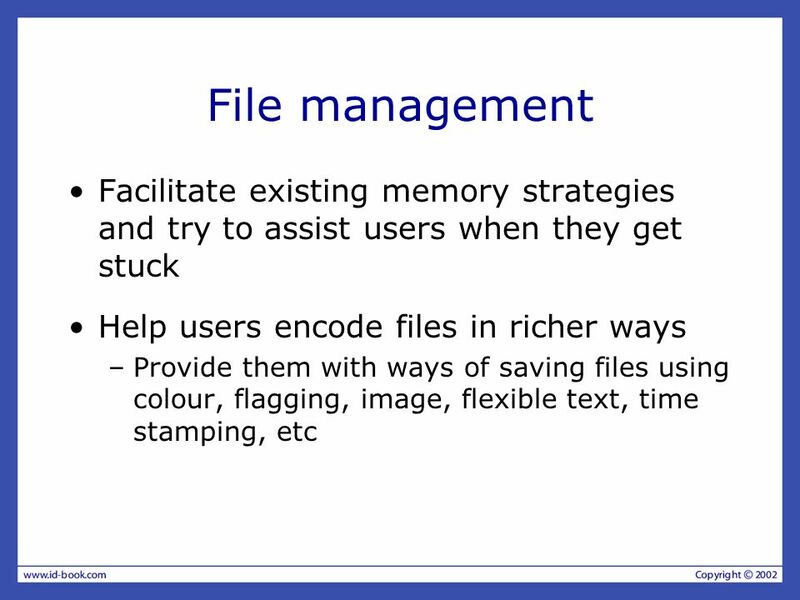 What are users good and bad at? 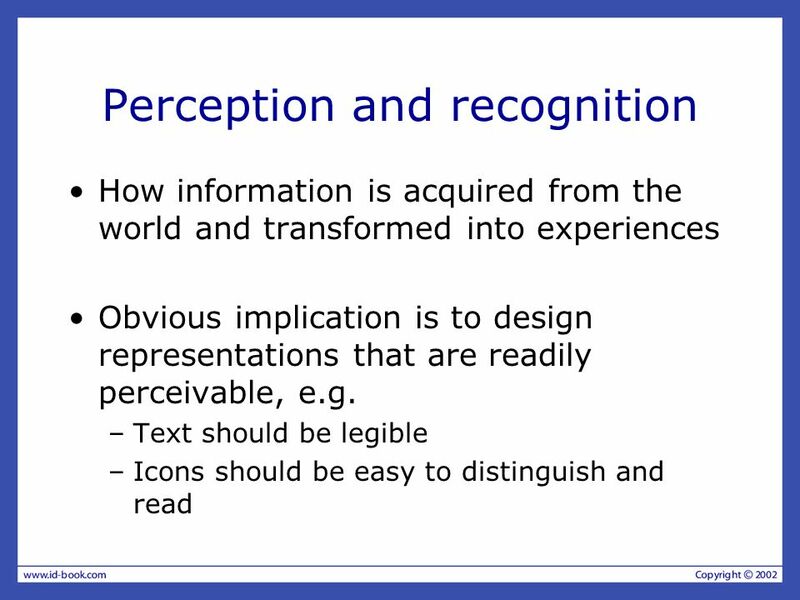 Describe how cognition has been applied to interaction design. 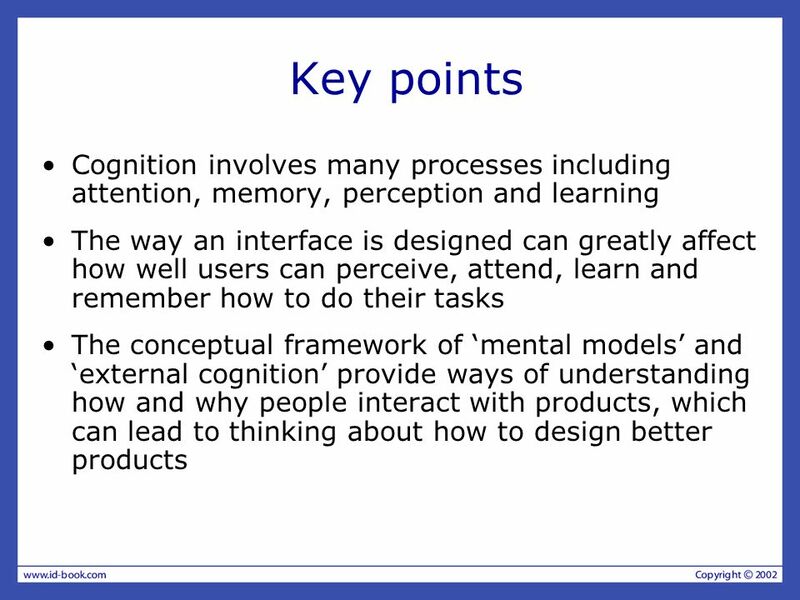 Barbara white : interaction design Understanding users cognitive social affective. 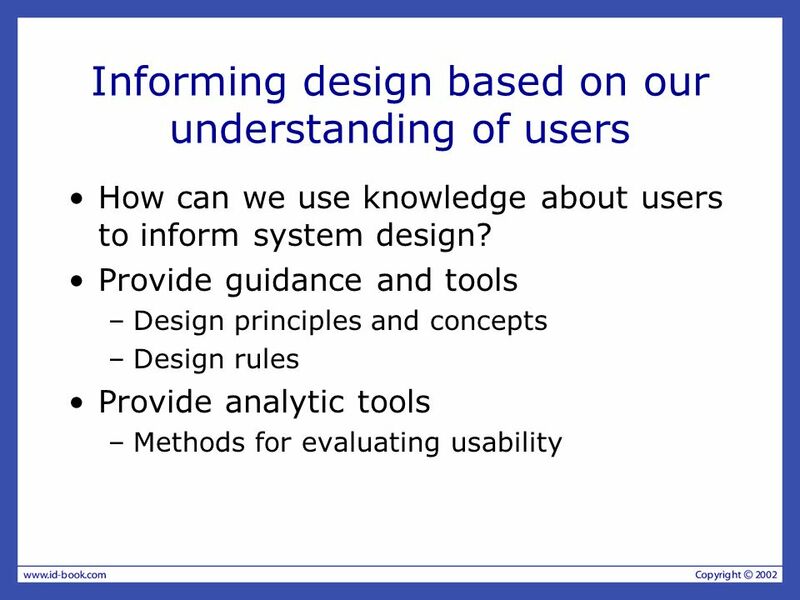 Chapter 3: Understanding users. 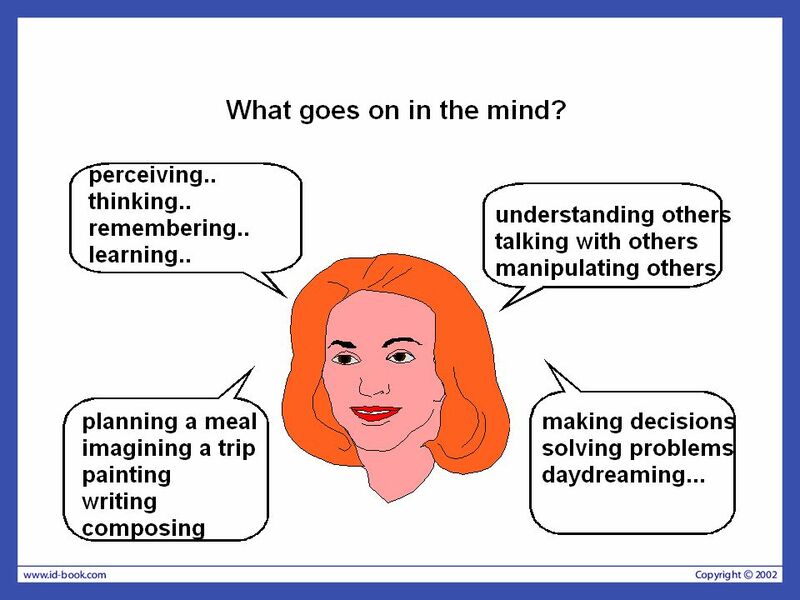 What goes on in the mind? 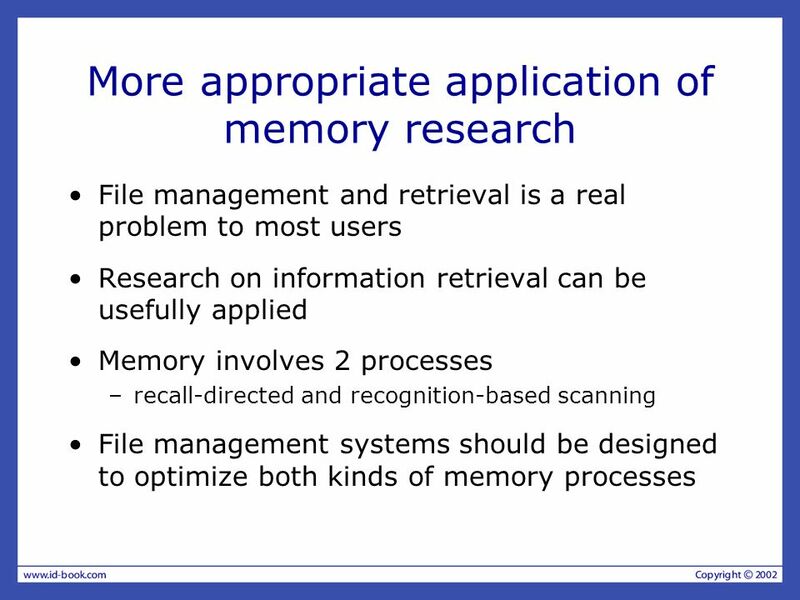 User Interface Design Notes p7 T120B pavasario sem. 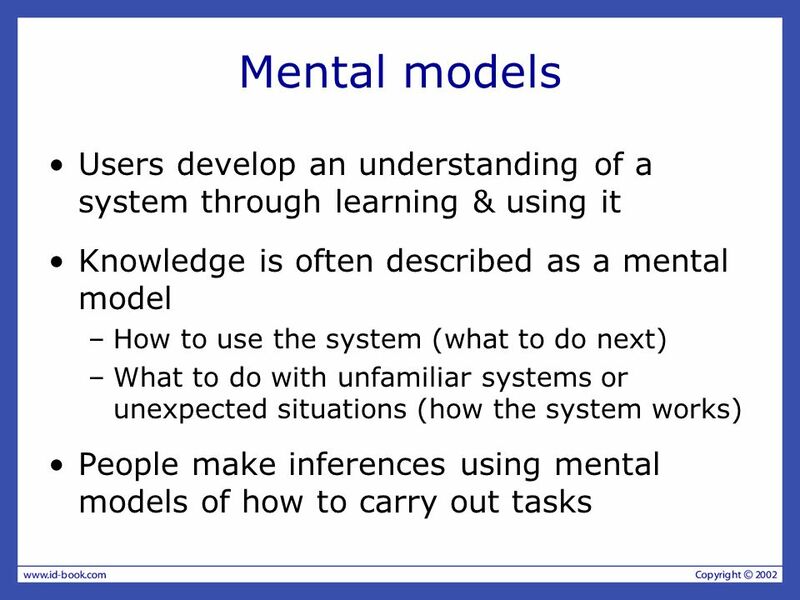 Cognitive modelling, Users models and Mental models What’s cognitive modelling ? 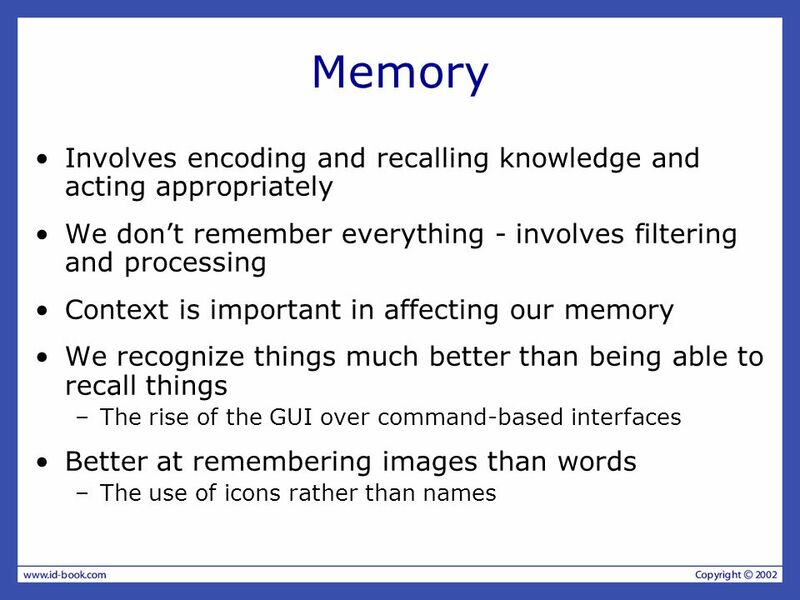 The human information processing approach Cognitive Models of Users in. 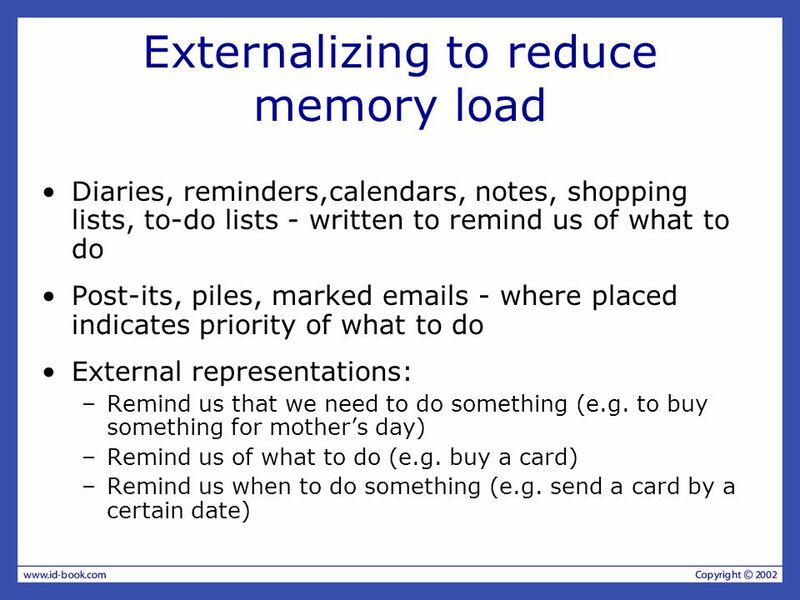 Part 2c: Requirements Chapter 2: How to Gather Requirements: Some Techniques to Use Chapter 3: Finding Out about the Users and the Domain Chapter 4: Finding. 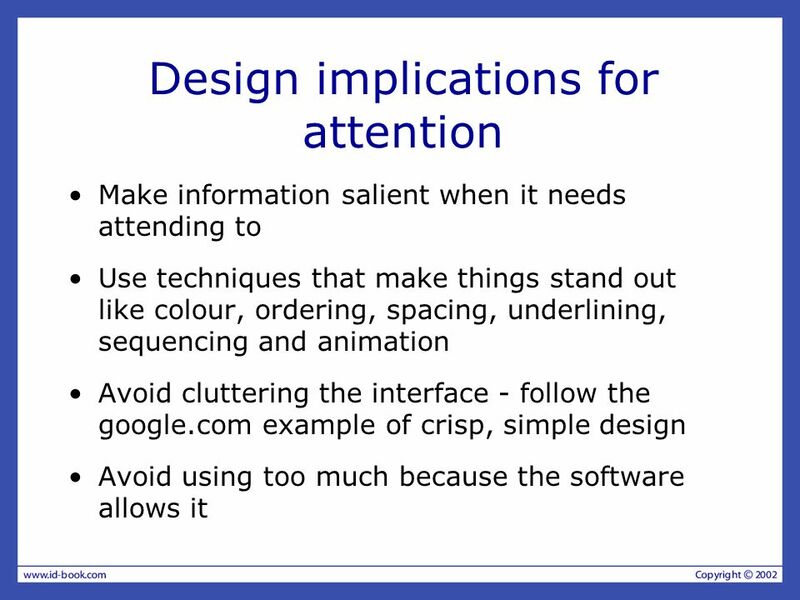 SIMS 213: User Interface Design & Development Marti Hearst Thurs, Feb 10, 2005. 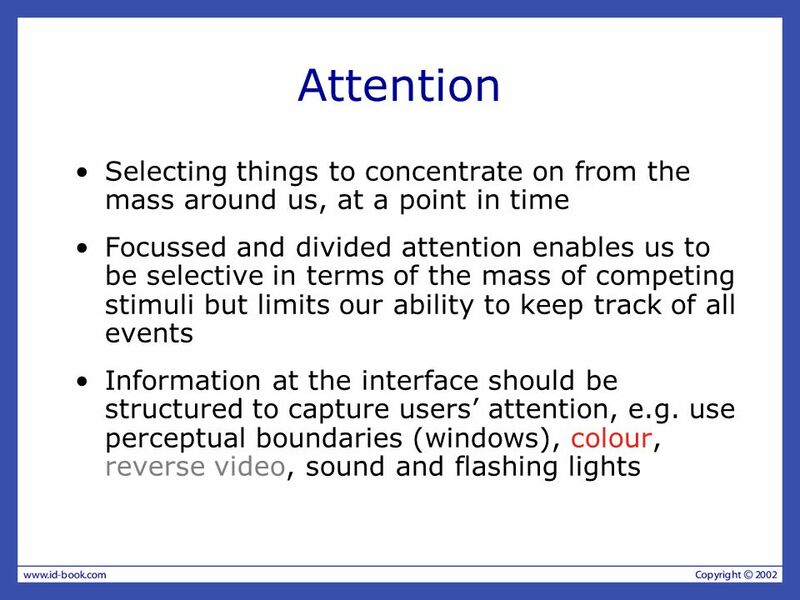 User Interface Design: Methods of Interaction. 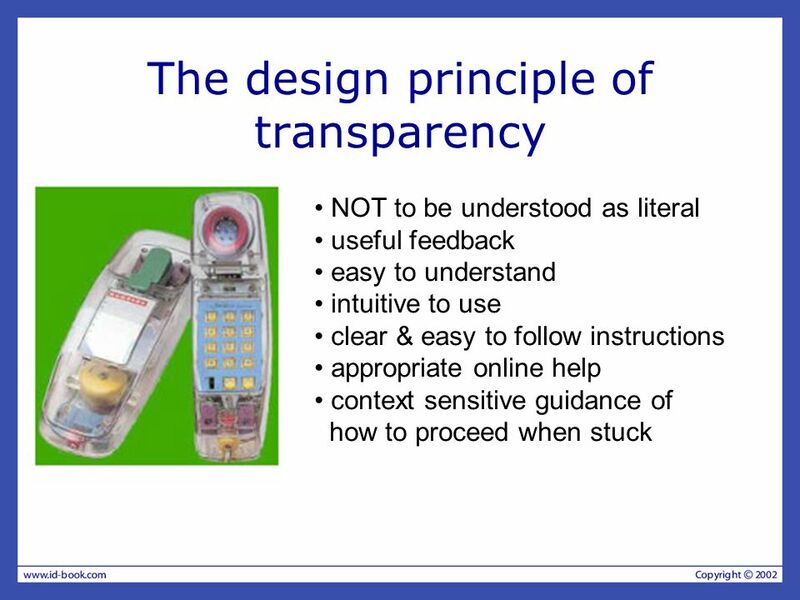 Accepted design principles Interface design needs to consider the following issues: 1. Visual clarity 2. 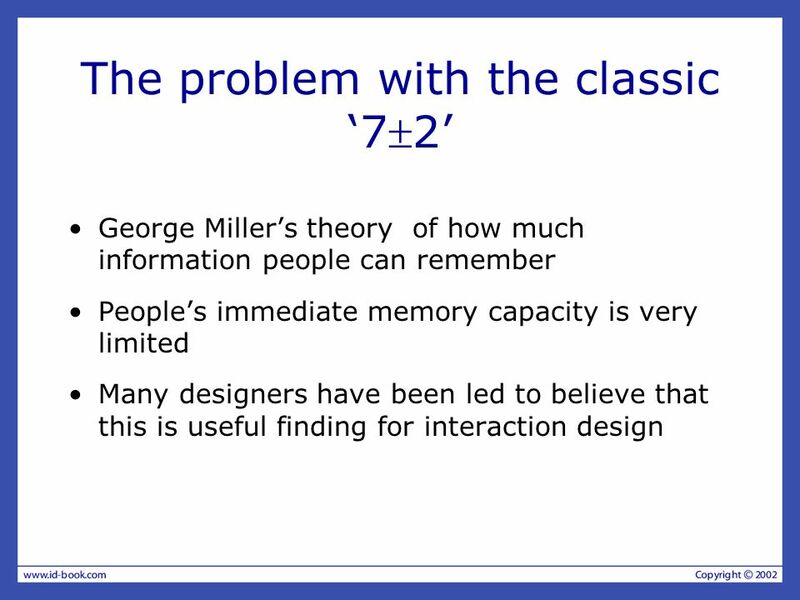 1 The User Lecture 2 Date: 2 nd February ‘05. 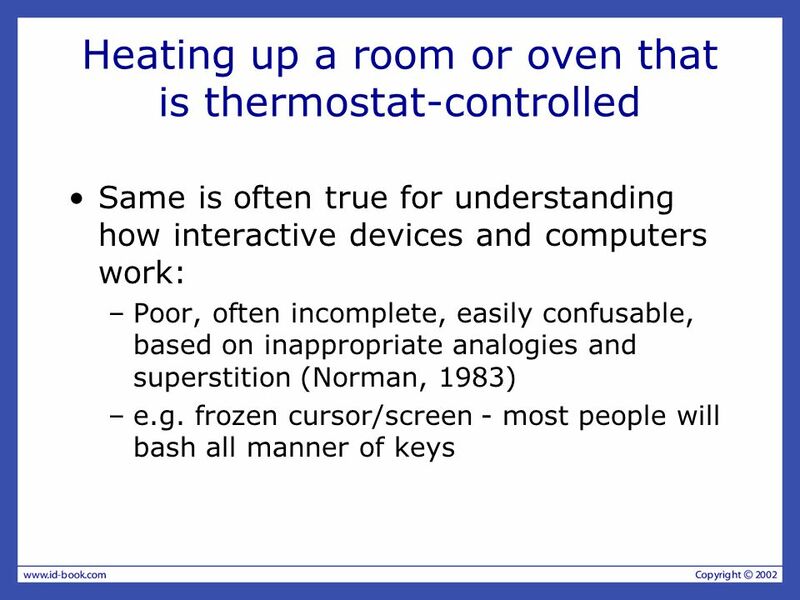 2 Overview of Lecture Introduce human considerations in developing a user interfaces. Interaction Design Session 11 LBSC 790 / INFM 718B Building the Human-Computer Interface. 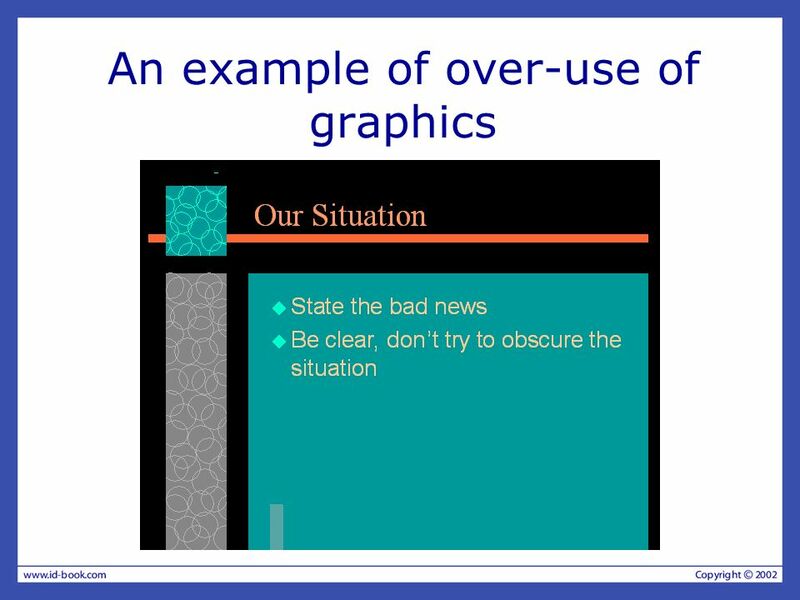 Today’s class Group Presentation More about principles, guidelines, style guides and standards In-class exercises More about usability Norman’s model of. 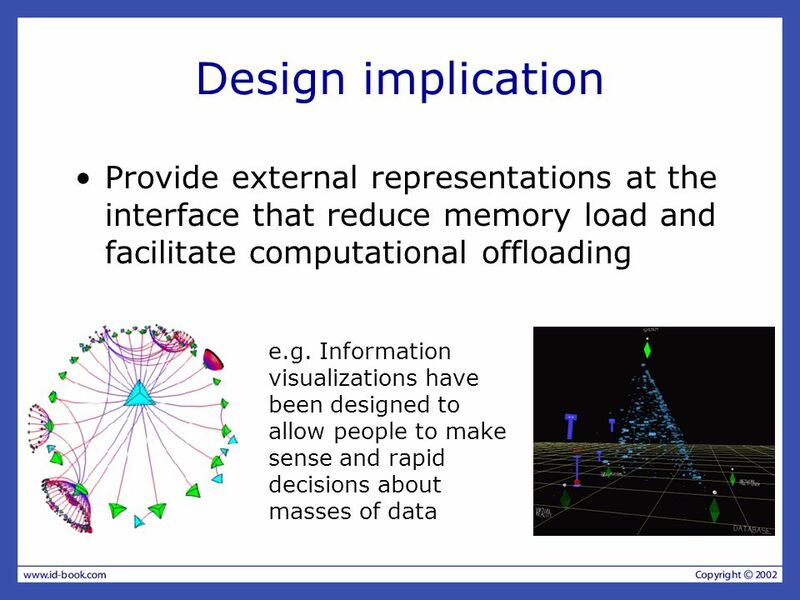 Interaction Design and Final Exam Review Session 13 LBSC 790 / INFM 718B Building the Human-Computer Interface.